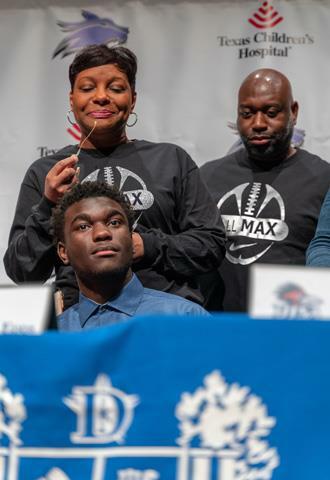 HOUSTON – Feb. 6, 2019 – It was a celebration of both athletic skill and academic achievement on Wednesday, when senior athletes at Westfield, Dekaney and Spring high schools took part in National Signing Day. At the event, held annually in February, students across the country sign letters of intent to attend universities of their choice and participate in collegiate athletic programs there. Altogether, 29 students took center stage during public ceremonies at their schools, joined by family, friends, teammates, campus and district administrators, as well as members of the Board of Trustees. View a photo gallery of National Signing Day at Spring, Dekaney and Westfield high schools. Coach Matt Meekins goes over some paperwork with Westfield Mustang Rayshawn James as he prepares to become a Texas A&M - Commerce Lion. 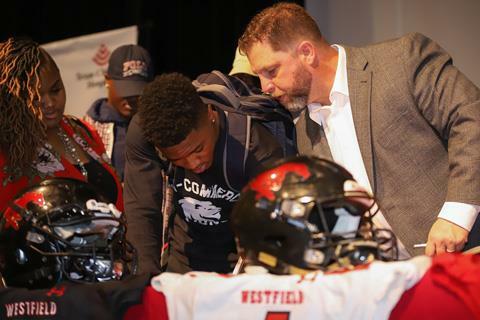 Speaking to a large audience of friends and supporters, Westfield Football Head Coach Matt Meekins said, “These young men had a great support system along the way. We are a team at Westfield High School, which means together everyone achieves more,” he said. Recognizing their hard work and sacrifice, Meekins also emphasized that a student athlete’s grades are the number-one determining factor in whether they receive scholarship offers. At Westfield High School, 10 students signed their letters to play football: Cedric Claiborne (University of Texas at San Antonio); Tre Coburn (Tyler Junior College); Keith Dixon (Ellsworth Community College); Rayshawn James, (Texas A&M University - Commerce); Ian Massey (Trinity Valley Community College); Franklin Montgomery (Tuskegee University); Alvin Poole (McPherson University); Jawaun Singletary (Stephen F. Austin State University); Jaylen Stanford (University of the Incarnate Word); and Na’keo Thomas (Texas Lutheran University). Terrance Gipson signed earlier to play football for Southern Methodist University. 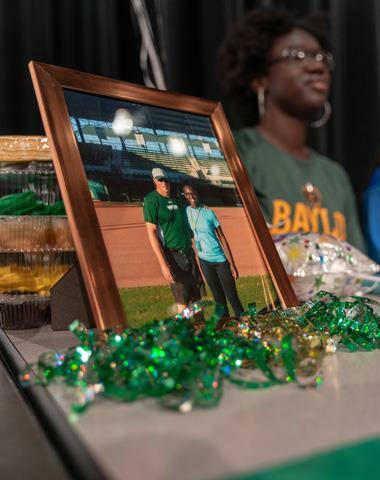 Yoni Moore displays a picture of her future coach at Baylor University. Spring’s Marques Pearson, who will play football at Kilgore College, gave thanks to his coaching staff and support system: “I would like to thank God, my friends and family, teammates and everybody who helped me through this process, pushed me to continue to keep my head on my shoulders, and to keep faith in everything,” Pearson told the crowd. Spring High School had a total of six students sign letters to play football: Ashalon Jones (Blinn College); Kamron Andrus (Southern Nazarene University); Titus Howard Jr. (Midwestern State University); Marques Pearson (Kilgore College); Marcus Senne (West Texas A&M University); and A’Zavier Roane (West Texas A&M University). Clifton McDowell Jr. signed earlier to play for the University of Louisiana-Lafayette. Spring seniors Sebastian Rodriguez (Richland Junior College) and Bryce Yosko (Northeast Texas Community College) signed letters to play baseball; Yoni Moore (Baylor University) and Yasmine Rivera (Hill College) both signed to play softball; Daniel Harold (Southern University) and Treyvon Mays (Texas State University) committed to track and field, and Travel Morris (University of Idaho) signed a letter to play volleyball. Maxwell Epps parents express their gratitude to the Dekaney High School staff as their son prepares for his future at Texas A&M - Commerce. Dekaney High School’s National Signing Day event featured six football players who signed letters: Marcus Banks (University of Alabama); Joshua Cephus (University of Texas at San Antonio); Malik Diop (West Texas A&M University); Maxwell Epps (Texas A&M - Commerce); Rayvion Flowers (Trinity Valley Community College) and Terrell Ratcliff (Bethel College).